The D Three Ten Oscillator (DTTO) was authored by Bill Mars. The difference in magnitude of a three and ten period moving average maps this oscillator’s path. A signal line, which is an EMA of the D Three Ten, is also plotted to help trigger trading signals. The 3-10 oscillator takes the difference between the 3-period EMA and the 10-period EMA plotted in the chart and creates a histogram below the chart. The 16-period EMA is overlaid on the histogram as the signal line to help trigger earlier trading signals. This is very much like a MACD presented as a histogram as in the case of the awesome oscillator which uses the 5-34-5 simple moving averages in its calculation. The 3-10 uses the EMA and crosses more frequently, producing more signals. I enjoy using the 3-10 oscillator when looking for subtle divergences which I will illustrate shortly. USD/CAD Example 1: The Daily Chart below of the USD/CAD has the moving averages plotted on the price chart and the DTTO plotted as a histogram. The fast line (3EMA) captures the momentum in price and the slow line (10EMA) captures the trend. When the momentum picks up, the difference between the two EMAs widen, and that is depicted in the histogram. When the EMAs cross up, the histogram moves from below the zero line to above the zero line. When the momentum increases, the slope of the histogram also increases. These are signs of a trend continuation. An early entry would be when the histogram crosses above the zero line after a consolidation. It is important not to take every signal, especially the signals during the sideways markets, so an understanding of market cycles (trends and corrections) would add value to trading decisions when using this indicator. How is the signal line used? When the signal line crosses the histogram after a steep trend with good momentum, that is an early reversal or profit taking signal. If the market is trending up, and good profits are made, one exit strategy would be to exit when the signal line crosses the histogram. A second exit strategy would be when the histogram crosses the zero line. What you choose depends on your trading personality and if you like to get out early or when it is confirmed. 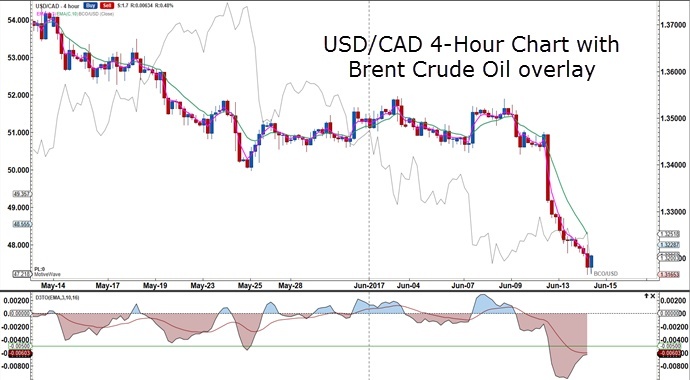 USD/CAD with Brent Crude Oil Overlay Example 2: The USD/CAD vs. Brent Crude Oil on the 4-Hour chart below illustrates that the recent sell-off in USD/CAD coincided with the sell-off in oil. It pays to watch oil when trading USD/CAD and vice versa since USD/CAD is often driven by moves in oil, as a commodity currency. Looking at the 4-Hour chart, one can readily see that as soon as the signal line crossed the histogram, confirmed with the histogram moving below the zero line, the USD/CAD continued its move down. The trigger was at 1.3500 and the move gave 300 pips to 1.3200 over the next few trading days. Another point worth mentioning is to follow the histogram and do not consider long positions until the histogram comes back to the zero line. As with any indicator, work with it for some time before adopting it. In terms of divergence, the DTTO can be used. If for example, in the chart below, the histogram comes back to the zero line, and then moves down again and forms divergence, that might produce a sign that momentum is slowing, and that a reversal may be forthcoming. Learn how the DTTO helps keep traders in the trend longer, also alerting traders when the market is sideways. Start incorporating the DTTO into your chart set-up. Finally, use the DTTO in developing trading strategies. 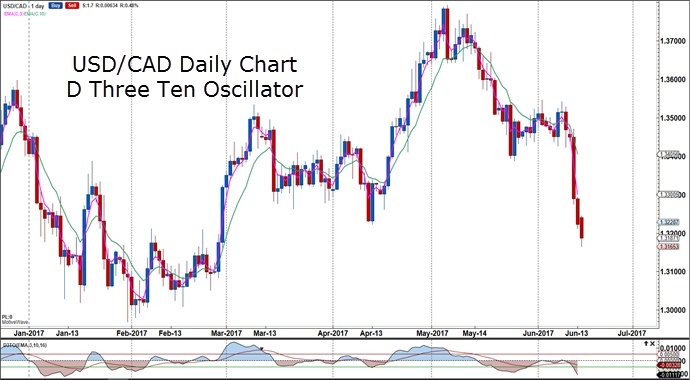 This entry was posted in Trading Tips and tagged D Three Ten Oscillator, forex trading, forex trading online, Indicator Toolbox – D Three Ten Oscillator, market analysis, trading, trading strategy, trading system.